The premier source of entertainment news since 1905. 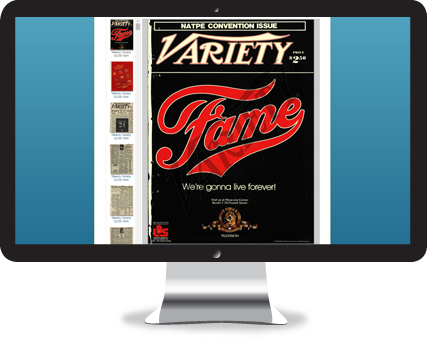 The Variety Archives provides comprehensive access to the entire editorial history of Variety, Daily Variety, and Weekly Variety. From the first issue of Weekly Variety in 1905 to the launch of Daily Variety in 1933 through the magazine's present weekly format, Variety has been the leader in entertainment news reporting for over a century. Variety Archives allows readers to access every page as it appeared in the paper! View Entertainment History Through the Lens of Variety! Traditionally used for educational, professional, and personal purposes, users can navigate through the Archives by name, date, keyword search, and more! Variety offers discounted rates based on licenses of 10 or more. Variety also offers IP range access to the Variety Archives. For more information, please call 323-617-9555 or click here to contact us. Columbia University, Baylor University, Emory University, Library of Congress, University of Kent, and more.